Norwegian Prime Minister Jens Stoltenberg told the Parliament on Wednesday that Norway’s fighter jet fleet assigned to the UN military operation in Libya became part of the US’ North African operation under US command as of Wednesday morning. 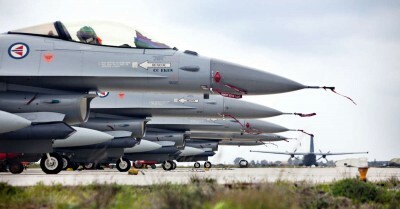 The jets are now cleared to take part in military action over Libya. Stoltenberg said the government held an extraordinary Council of State Wednesday morning at which it was confirmed that the Norwegian forces will take part in the so-called operation “Odyssey Dawn,” and that Defense Minister Grete Faremo had instructed defense chief Harald Sunde to transfer command. Faremo has insisted, however, that Norwegian officials will still have “full control” over how the Norwegian forces will be used. Military personnel already stationed on Crete themselves told Norwegian Broadcasting (NRK) on Wednesday that they weren’t preoccupied with which countries will lead the operation, noting that most of those participating are already close allies and have taken part in joint military operations before. They mostly were concerned with getting a “clear mandate” over what sort of military action would be used. Stoltenberg claimed there was “full agreement” within the government on the deployment of the Norwegian forces. He dismissed reports that the Socialist Left party (SV), one of the three parties making up Norway’s government left-center coalition, was opposed. Stoltenberg also asked for permission from the Parliament to conduct a full overview of Norway’s involvement in the Libyan operation for the Parliament in the new “near future.” He stressed that the Libyan operation was not a NATO operation that’s only being carried out by western nations. Command may be assumed by NATO, he said, but he claimed the coalition of countries carrying out the UN resolution to protect Libyan civilians from their own government was broad-based. It currently includes the US, Great Britain, France, Qatar, Norway, Spain, the United Arab Emirates, Greece, Canada, Italy, Denmark, Belgium and the Netherlands.